It was good that it was small and easy to use. The lift head was 4m, but there was only a 4m specification for the load chain and hand chain, but it was possible to add the load chain and hand chain in 1 meter units elsewhere, so that way if possible I want. This review is about item#74729628. This review is about item#39585892. Other than the one dealing with the lift of 4 m, it was indeed in Monotaro. The goods were small and light as the name suggests. Usually I use a chain block of 1t 2.5m, but the chain block I bought this time is .5t so it is light and the lift 4M so I can use it in different ways, so I could do a good shopping. Immediately, it is used by removing engine parts and rotating engine blocks. It is very useful. This review is about item#39585901. There is no problem in lifting, but if you try to take it down with a load, it may be locked and the load may not be released. However, I read the instruction manual but there is no particular explanation if there is a problem with my usage. Reliable sense of domestic display and compact, light and easy to handle. It is just fine as it does not work heavily. This review is about item#74729637. The price is cheap, it is compact and lightweight, it can function and it can be used without problems. This review is about item#39585926. Well it is useful somehow. I wish it was a bit more light on the main body. Use it when lifting materials with three forks. Since the main body itself is light, work is carried smoothly. I use it satisfactorily with well-made items. I will also purchase it. This review is about item#39585917. Compact and lightweight and easy to use. There is somewhat anxiety about the corrosion protection of the chain. 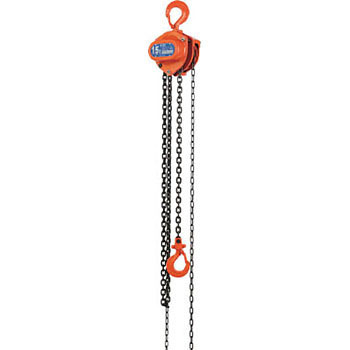 It is lightweight and compact, easy to hang and easy to handle. I think the clay seems to be somewhat rusty. I bought 0.5 t. It is light weight and easy to use. I think that the stroke is a little more (1 m more). I arrived early, and I was able to use it smoothly with firm oil. Compact and easy to use, it is handy. Because it is light and small, I carry it and use it in a car, or use it by moving to the necessary part of the factory. It is good to move and use. It's good to catch something heavy from the torii of the truck. Chain Block, "Kito Mighty M3"